Hiya guys. I'm a part of a lot of Facebook groups and one of the things I always see is ladies asking for a list of shops. Even when there is a list there is sometimes confusion over shop owners or shop urls. Welp I finally bite the bullet and decided to compile a list of... well... everything! My main focus was easy access so I created the spreadsheet in Google docs, which can open in your web browser and on mobile won't an issue. 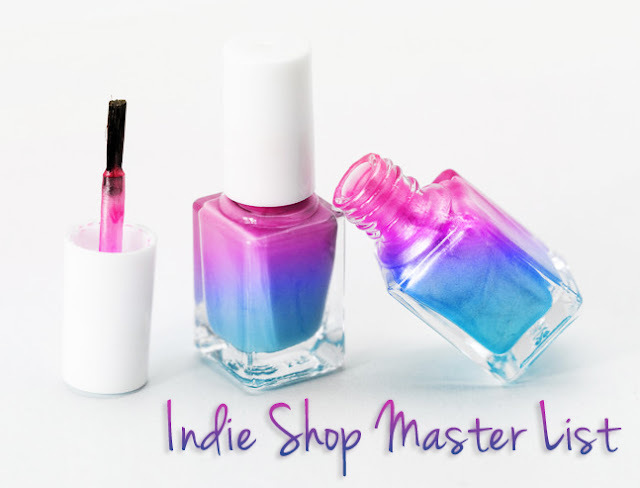 My Indie Shop Master list has all indie shops listed in alphabetical order. You can also find the shop owner name, shop url, and facebook fan group url. Do you know an indie shop that isn't listed here? Leave me a comment below or email me and it'll be added within 48 hours. I am, however, the only one managing this list so if you spot an error just shoot me a message with the correction please. Thank you to those who have sent me corrections already, every bit helps make this list possible! Be sure to bookmark and share. After all buying polish is always more fun when you do it with a friend! This is such a great service to so many! Thank you so much for putting this together!!! Especially with listing the names of the shop runners WITH the listing, that is what I am most excited for! No problem! I'm glad you can find some use out of it as can so many others. It was definitely long over-due in our community. You are awesome! Thank you for creating this! !